An extra room turned home gym or a small corner devoted to your workout is nothing when you don’t have the motivation to exercise. Encouraging yourself to use these spaces is always the hardest part. So, in this blog, we are going to enumerate ten design elements that can help get you fired with enthusiasm. 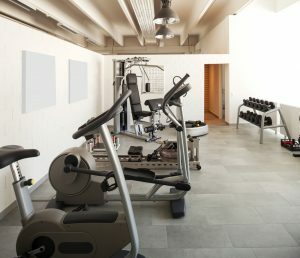 Your gym floors must keep you safe from injuries. We always recommend sturdy hardwood floors. It can withstand heavy equipment and intense exercises. If you want softer alternatives, you can go for non-slip carpet tiles and cork floors. These are soft to walk on and easy on your joints. Doing heavy workouts will be less painful, especially for the elderly. Aside from anti-slip properties, your gym floors should be antimicrobial, easy to clean, eco-friendly, and affordable. Some carpet tiles come in sophisticated designs and colours. If you want artsy floors, these might work for you. Storage is a must in every room of the house. We recommend using sturdy shelves or racks to store your weights and other exercise props. Make sure that it can handle the load or else it will break apart. Shelves, as we know it, take up floor space. You can push the shelves against the wall or use it to divide the room. The latter will enclose and separate the home gym from the space adjacent to it. Don’t have room for shelves? Consider more space-saving and petite storage. For example, a rolling steel kitchen bar is strong enough to hold some of your gym equipment. Instead of liquor, your kitchen or bar cart will hold your collection of hand weights and clean towels. Another option would be storage baskets on the floor. These conceal clutter and other gym essentials. You can store these baskets under the bench or on the shelves. Whichever kind of storage you have, the important thing is you keep your storage clean and organized at all times. Neat home gyms are attractive and exciting to use. If you follow instructional videos for your workout, consider having a TV in your home gym. We recommend hanging and securing yours on the wall to avoid accidents. Use adjustable TV wall mounts so you can tilt the screen towards your location. The good thing about having a TV in the home gym is that you lose track of the time. You won’t notice time passing by while you’re on the treadmill or on your stationary bike. You multitask when you watch fitness videos or other shows you like. When a TV is too much, leave enough space for your laptop or tablet on the tabletop. You can still watch your home workout guides from smaller screens. When visuals don’t work, try to boost your motivation through playing your personalized workout playlist. You don’t need superb sound systems or stereos inside your home gym. One lightweight speaker that you can pair with your phone will do. Most fitness pros recommend that you put your phone away while working out. You don’t want to be distracted with a Facebook notification, right? That being said, playing music on a distant speaker rather than plugging in your headphone and attaching your phone to your body is a wiser idea. If you’re lifting weights, doing yoga, or dancing Zumba, mirrors are your best pals. Mirrors help you perfect your form and movement. It helps you check your dance steps and poses every once in a while. We always recommend using wall mirrors over freestanding mirrors. Freestanding mirrors are hazardous when everything around it (especially your body and equipment) is in motion. The mirror might fall, break, and hurt you. The architects in Superdraft Australia reminds you that your gym wall mirror doesn’t have to be large and wide. You’re not required to have floor-to-ceiling and a wall of mirrors. But, it must be secure. They recommend working with builders who can fix the mirror on the wall so it doesn’t move or shake. 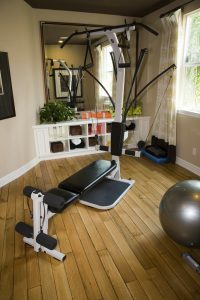 Since mirrors are reflective surfaces, these can boost lighting inside a windowless home gym too. In the event that your home gym is far from the kitchen, we recommend putting a mini-fridge in your workout area. Your workout feels more complete when you can grab a refreshing drink immediately. With a mini-fridge right next to you, you can chill carafes of water and store freshly-made fruit shakes or healthy smoothies that you want to drink after your workout. Chairs are part of a low-cost home gym. 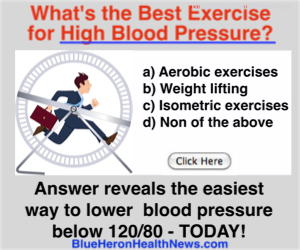 There are a number of short exercises that require a stable chair or a bench. After the exercise, you can sit on it and rest for a while. Based on experience, footstools are a great alternative to weight benches. If your footstool doesn’t belong in your living room anymore, put it in your home gym. It works every time the exercise calls for a chair or bench. Another furniture to consider is a low table. These are perfect when you do a lot of floor exercises. When you meditate a lot, low tables will be perfect for your altar — a good place to light a candle and display an inspiring picture or statue. Also, you might find it easier to sit on low tables instead of sitting on the floor. It’s safer for the knees and hips. To make your workout zone more inspiring, we recommend that you personalize your workout area with art that reminds you of your goal. Use an oversized photograph or poster to give your home gym a focal point. You can also use wall decals of fitness quotes that inspire you the most. A well-ventilated room is the best room to turn into a home gym. It always feels hot and humid whenever you work out, therefore, you need a room with an operable window. Open it to allow the air to circulate inside the room. At the same time, turn on a quiet circulating fan. It blows off the stale air outside the house. When your exercise space is well-ventilated, you will feel more invigorated. If you feel this good every time you work out, you’ll be happy to do it again. Finally, the barre. A barre is incredibly useful especially when you’re doing exercises that require you to balance your body while doing strength training exercises. It keeps you from falling. These are your home gym essentials, but you’re not required to have them all in your workout zone. If you think that an item is important for you, invest in them. If not, you can skip them. Personalize your space by addressing your needs. Make an effort to make workouts easier and less stressful for the body. That’s how you make an inspiring and effective home gym. Charlene Gonzales is a design writer from Superdraft, the largest team of architects and home designers in Adelaide, Australia, who offer complete design solutions to any size residential or commercial projects. She believes that busy schedules and demanding work are not hindrances to a healthy lifestyle. With proper home design and habits, you can stay fit and healthy. This entry was posted in Exercise, Fitness and tagged exercise, home gym. Bookmark the permalink.